ZOUSTAR (AUS) (Bay 2010-Stud 2014). 6 wins-3 at 2, VRC Coolmore Stud S., Gr.1, ATC Golden Rose S., Gr.1. Leading Aust. First Season Sire in 2017-18. Sire of 84 rnrs, 38 wnrs, inc. SW Sunlight (VRC Coolmore Stud S., Gr.1), Lean Mean Machine, Zousain, Sun City, Charge, Persuader, Zoustyle, SP Madam Rouge, Mizzy, Quattro Katie and of Ronstar, Be My Star, Dancing Fighter, Haut Brion Her, Kenyan Wonder, Solar Star, Star Fall, Zoubo, Zoutori, etc. His oldest progeny are 3YOs. MISS SINGO, by Big Brown. Unraced. This is her first foal. Moon Spinner. 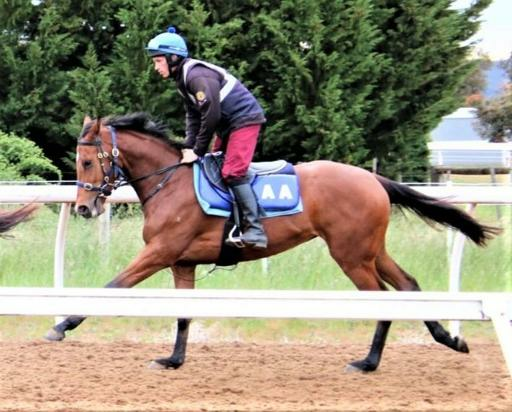 2 wins at 1000m, 1100m in 2017-18, SAJC Adelaide Galvanising H., Quayclean P.
Born Regal. 4 wins to 1500m to 2017-18, 2d WATC Book for AWROA Awards Night H., 3d WATC Festival of Perth Racing H., LD Total H., Bonuses are Bigger With Westspeed H.
Aalto. Placed at 3 in 2017-18 in Aust. Berry Baby. Placed to 2017-18 in Aust. MISS MOONEY MOONEY (Redoute's Choice). 4 wins. See above. From London. 6 wins-1 at 2-from 1350m to 1800m, A$127,501, BRC Green Bins Skip Bins & Recycling H., Bundaberg Rum Select Vat P., Sky Racing H., 2d BRC Sky Racing H., Bakerbooth Plumbing H., Drumbeats at Lyndhurst H., Oztronics H., 3d BRC Carlton Mid H.
BETTER THAN READY (More Than Ready). 8 wins-1 at 2-to 1200m, A$484,875, ATC Brian Crowley S., L, BRC Falvelon H., L, Mick Dittman P., L, Keith Noud H., L, Darley Australia H., Ormiston College Redback H., Ramsay Health Care 2YO H., Club Super H., 2d BRC Coca-Cola Amatil H., 3d BRC BTC Cup, Gr.1, Jim Beam H., 4th MRC Rubiton S., Gr.2, BRC Hampden S., L. Sire. Sally's Realm. 2 wins at 1200m, 1400m in 2017-18, WATC Glenroy Chaff H., Murlpirrmarra Connection P., 2d WATC Peacock Bros H., 3d WATC Crown Perth H., Seven Wonders Products H.
Murder of Crows. 4 wins to 1400m, A$180,815, ATC Hyland Race Colours H., Jockeys Celebration Day H., Australian Turf Club H., 2d ATC Australian Turf Club P., TAB Rewards H., Canterbury Park H., GCTC Premiership Jockey Luke Dittman P., 3d ATC Paslode H., Schweppes H., Big Sports Breakfast H., GCTC Sky Racing H.
ILLUSTRIOUS LAD (I Am Invincible). 10 wins-1 at 2-to 1250m, A$771,840, 110,100Dhs, to 2018-19, VRC Tab.com.au S., Gr.2, AR Creswick Series Final S., L, SAJC City of Marion S., L, WH Wylie H., L, Boxing Day Family Races 2YO P., Brian Vivian's 70th Birthday H., Exelsuper H., MRC JB Scott H., 2d MRC Schillaci S., Gr.2, Kevin Heffernan S., Gr.3, SAJC RN Irwin S., Gr.3, MRC Italktravel S., L, VRC Phillip Schuler H., 3d Ballarat TC Magic Millions 3 & 4YO Classic.